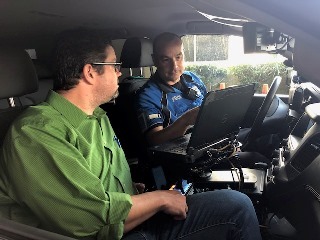 The Citizen Ride-Along Program is designed to educate citizens about police duties and allow them limited participation in the day-to-day activities of an officer at Tampa International Airport. Interested members of the community, including students, may participate in this program to promote education, awareness and communication about police department operations. Applicants must be eighteen (18) years of age or older to participate in the Citizen Ride-Along Program. Applicants may only apply to participate in the program once a year unless otherwise approved by the Director of Public Safety and Security. To apply, complete an application for the TIAPD Citizen Ride-Along Program and adjoining waivers and return to TIAPDRecruiting@TampaAirport.com. Applicants will be contacted by TIAPD personnel to set up a date and time for the ride-along. Final approval of all applications is at the discretion of the Director or Public Safety and Security. NOTE: TIAPD Ride-Along application must include the full name, date of birth, social security number, emergency contact information and the reason the applicant is requesting to ride along (i.e. civic or educational reasons).